The Orlando Urban Trail marks a big step in Orlando becoming a more bike- and pedestrian-friendly city, linking businesses, restaurants, shopping, parks, cultural sites, and residential neighborhoods. The trail to date runs about 4 miles in segments: (1) in Downtown Orlando from Church Street, along Gertrude's Walk, and across a bridge over W. Colonial Drive to Orange Avenue (includes some on-road/sidewalk riding); (2) an on-road route (trail gap) from Orange Ave. to Magnolia Avenue near Weber St., and (3) starting at Magnolia Avenue to the cultural corridor at Loch Haven Park, to the northern city line at Mead Garden in Winter Park. Ultimately, the Orlando Urban Trail will connect to the southern end of downtown at South Street and the Amway Center, and will link to three SunRail stations (Historic Church Street, Lynx Central, Advent Health). An on-road link to the Cady Way Trail has also been mapped out. Detailed map and photos below. A beginning for downtown Orlando FL, and worth a look! The trail bridge over W. Colonial Drive (SR 50) in Downtown Orlando is a big plus. The history plaques along the Orlando Urban Trail are a great addition. We biked the Orlando Urban Trail both south and north of Loch Haven Park (the approximate mid-point of the trail). South, we biked from Loch Haven Park to Magnolia Ave. in downtown Orlando where the paved trail ends. We biked over the new bike/pedestrian bridge at W. Colonial Drive, to Gertrude's Walk and Church Street. North from Loch Haven Park, we biked to Mead Garden in Winter Park. Note: per Orlando code, bicycles are allowed on sidewalks within the city, except "where prohibited by clearly visible signs or markings." Orlando Urban Trail... Loch Haven Park South to Magnolia Ave.
Loch Haven Park is at about the middle of the trail and offers plenty of parking. Heading toward downtown, a bridge crosses Lake Formosa then the trail goes through a residential neighborhood. In this section, the trail follows the old Dinky Line rail bed - the historic former rail line to Winter Park. Crossing Virginia Drive leads into an industrial area. 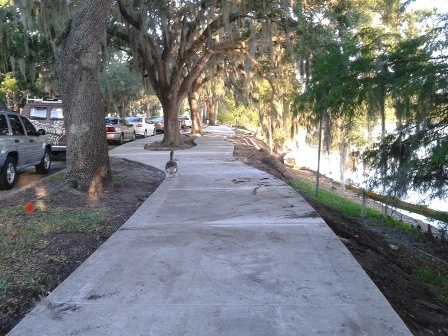 At Ferris Avenue, the trail meets Lake Highland Drive at Lake Highland Preparatory School. Link also from here to Cady Way Trail (see below). A convenient shortcut to the Quantum Leap Winery! 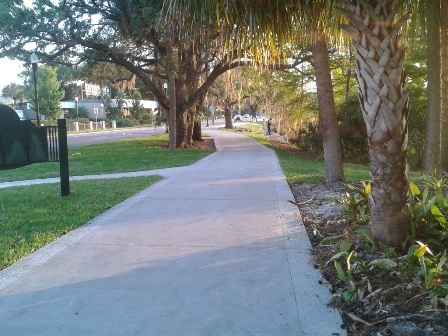 The trail follows Lake Highland Drive around Lake Highland Preparatory School, and ends at Magnolia Avenue downtown. Further development will link to Church Street and the Amway Center. Trail goes off the roadway, toward Magnolia Ave. This route has some incomplete trail sections, and includes biking on the road or sidewalks. Be very careful on the road and at cross-streets as traffic can be heavy, especially during the week. Public parking lots are available. Magnolia Ave. to Colonial Dr. Bridge to Livingston St.
From Magnolia Ave., an on-road route leads to the trail bridge. We recommend continuing south on the Magnolia Ave. sidewalk to the traffic light at Marks St. Cross Magnolia and ride on the Marks St. sidewalk to Orange Ave., cross at the light and continue south on the sidewalk along Orange Ave. to the connector to the trail bridge at 790 N. Orange (see map). Across the bridge, the trail runs to Livingston St. past the Lynx bus/SunRail train station. Both buses and trains are equipped to carry bikes. Here is a work-around, the trail is under construction - turn left on Livingston St. along the green bike route markings. Then turn right onto the sidewalk along Orange Ave. to Jefferson St. Turn right at Jefferson St. and look for the colorful mural - turn left across the railroad track onto the trail along N. Gertrude Ave. and ride on Gertrude's Walk to Church St.
Click here to find out about Gertrude. Princeton Street (Loch Haven Park) to Dorchester St.
Near Loch Haven Park are three intersections - Princeton Street, Rollins Street, and North Mills Avenue. The trail passes the museums, theaters, and Science Center, then follows North Mills Avenue over Lake Estelle. Cross Rollins St., then North Mills Ave.
A short section of trail runs next to Dorchester Street, then the trail goes on-road following Lake Shore Drive to Nottingham Street and Mead Garden. There is not a lot of through traffic in this area, but as always be aware and considerate of auto traffic and the residential nature of the neighborhood. Gaston Edwards Park is a popular recreational area along N. Orange Avenue at Lake Ivanhoe, close to restaurants and shops on Orlando's "Antique Row." 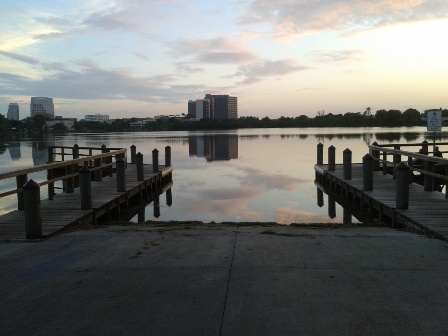 A boat ramp allows launching onto Lake Ivanhoe, popular with water skiers and paddle boarders. The park has sand volleyball courts, playground, and a fitness course. 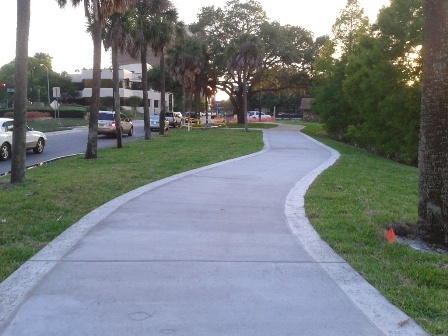 The Ivanhoe Trail segment links to the Orlando Urban Trail via sidewalk at Magnolia Avenue or at Highland Avenue. Loch Haven Park is a main cultural center for Orlando, with the Orlando Museum of Art, Orlando Science Center, Orlando Repertory Theater, Orlando Shakespeare Theater, Orlando Fire Museum, and Mennello Museum of American Art. 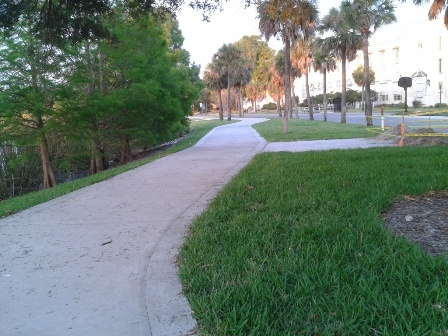 The 45-acre park itself offers a pleasant respite, as well as access to the Orlando Urban Trail. An on-road route has been mapped out from the Orlando Urban Trail at Lake Highland Drive and Ferris Avenue to the Cady Way Trail at Lake Druid Park. Signs, "sharrows" and bike lanes along the roadway mark the route.